Great to know that there are still major Consultancy firms ready and willing to wade-in to help firms understand the type of risks that could “kill” an enterprise but about which too little is widely known, less is understood and next to nothing is done to extend the current “risk horizon” or to build RESILIENCE into the Commercial/Corporate defences. 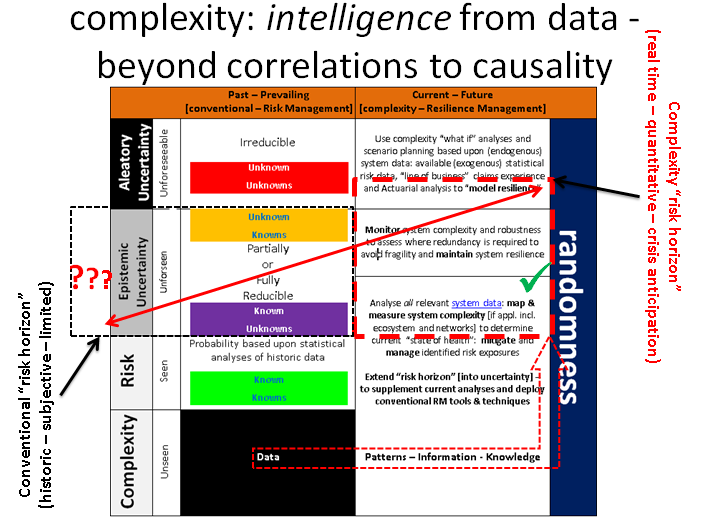 Of course the following perspective is certainly not the only one available…”Black Swans”, Systemic Risk, Complexity, Uncertainty are topics that I have covered in this blog on MANY occasions…but it is worth a read. It may answer some questions or prompt new one’s, either way, you will have given the matter further thought and, if it leads you to a more resilient enterprise, the benefits will be communicated to others…and you can thank me later! These events can threaten a com­pany’s survival, and boards and senior leaders are responsible for protecting shareholders and other stakeholders. They must ask, What else can go wrong? Still subjective, still correlation but getting closer… :: Accenture identify characteristics of "The Risk Masters"
So, if reports from, the likes of AIRMIC “Roads to Ruin”, World Economic Forum/Zurich, FSA (on RBS), PwC, IBM, UK Government, Zurich and Towers Watson (to name a few recent contributors) have failed to penetrate engrained – but flawed – belief systems, it may be a forlorn hope that Accenture can succeed with this report…but, we live in hope! Hence my resolve to share this kind of useful information as widely as possible. WEALTH WARNING: all risk management is not made equal and it should not be solely about risk…but reward! More reports into the subjects of risk management, complexity and compliance can also be found here. Of the recognised Consultancy firms it certainly appears that AT Kearney have the best understanding of the subject of complexity but, unlike Ontonix, NONE, to date, have presented a, measurable, definition or means by which an organisation can begin to explore the issue themselves. I could not agree more with these words of wisdom from David Law. This isn’t the first time that PwC have tried to warn the industry about the need to “evolve” for survival in a rapidly changing risk environment. Contrary to what some would have you believe, the lack of innovation – of the “creative destruction” variety – as evidenced in self-similar operations, culture, products, etc. IS all the confirmation that one should need to establish that “risk businesses” are still intent upon looking at the past for answers about the future instead of scanning their own risk horizon and creating resilient strategies for uncertainty! David Law, global insurance leader at PwC, said: “The immediate pressures of market volatility and regulatory upheaval have left little space in boardroom agendas for insurers to think about how to remain competitive in the years ahead. It is vital insurers do not get blinded by the current challenges and set a clear vision for the future. He added: “Insurers who are too slow to respond to the changing market dynamics could find themselves on the back foot competitively and struggling to secure sufficient capital. via Pwc: companies must adapt to changing market dynamics Insurance Age. Ontonix:: how much globalisation can the World afford? Risks arise in the world, so our view of the world affects our view of risks. If a risk is ‘really’ such a low probability then it seems reasonable not to let it dictate our lives. The real risk is from risks that are under-appreciated. For example, natural risks are often thought of as natural, but what is of concern is not so much the once in a century event that happens about once every hundred years but the one that happens more often. A natural disaster is possibly just bad luck, but more often its ‘likelihood’ or impact had been underestimated. Part of the problem is risk management itself. After a flood the risk of subsequent flooding is appreciated and drains are kept clear, but after a period without flood . we ’learn’ that floods are unlikely, the perception of risk reduces and drains can remain blocked. The risk of flooding increases. More generally, we manage our lives according to our perception of risk, thus there is a reflexive relationship: a risk is only a serious risk if it is under-appreciated. Thus the inherently challenging risks are those that are invisible, obscure, complex, confused or otherwise outside our management approach. Perhaps we should rise to the challenge?